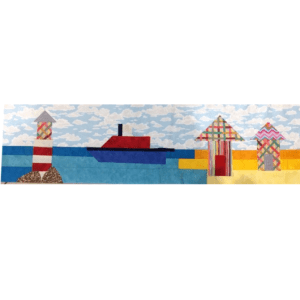 Our row is a scene inspired by a trip to the seaside and our very special relative. Lifeboat man, Henry Blogg (1876-1954) was the most decorated in RNLI history. There’s a museum to his memory in his hometown of Cromer, Norfolk. On this hot sunny day, the lifeboat and lighthouse protect us from the perils of the sea. The row is a simple mix of piecing and appliqué, and every row can be unique to the maker. Beads, shells and buttons could be added to the panel.